Today, I am reminded of this verse from the bible. As a woman, I am one of the many who tend to talk too much. There are just so many things in a woman’s mind that we want to say, specially when we’re angry. 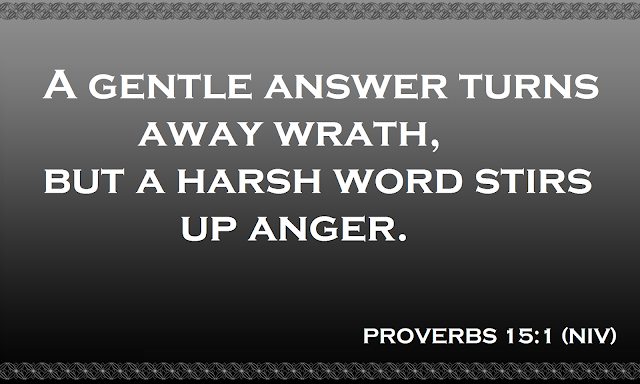 These words in Proverbs 15:1, gives me more reason to do my best to stay calm when I am mad. A gentle/soft answer turns away wrath but a harsh word can star up anger even more. When we are in conflict with someone, it’s better to converse to them nicely instead of arguing and not be able to reconcile after, which will just make the situation even worse. What do you do when you’re mad? Do you attack the person right away? Or do you stay quiet and try to calm down first before confronting the person?